The apartment is on the top floor of a manor with garden and olive grove. It has a separate entrance and you can go in through an external stair. It has a new, simple, functional furniture and some useful tools to make your stay very comfortable. The position of the house offers a wonderful view; the lovely landscape on the sea which extends from “Capo Bianco” to Pietre Cadute” with the green of the Oriented Natural Reserve “Foce del Fiume Platani” and the blue Mediterranean sea with its 5 Km of beach, the wood, the countryside and the quietness of the place are a precious present offered by nature to spend quiet and relaxing holidays. Borgo Bonsignore is a little place 9 Km far from Ribera (the so called “oranges city”). It is very lively in summer, but the nature of the place and the warm climate allow you to spend your holidays there in any period of the year. From the house you can easily reach interesting tourist sites like Eraclea Minoa (archeological excavations) 5 Km from Borgo, Scala dei Turchi,Caltabellotta (the peace city) 25 Km, Sciacca (the thermal city) 20 Km, Agrigento 38 Km, Palermo 120 Km, Selinunte, 45 Km….. The property is spacious/well equipped and kept immaculately clean. From the balcony the views of the surrounding countryside and the sea are spectacular, it is also an ideal spot to read or relax after a busy day. There are numerous beaches nearby the nearest is within easy walking distance, we enjoyed many walks along this beach, the sea is fantastic. There is a small general store nearby covering most essentials and a Restaurant. The nearest town is Ribera. There is a large market here every Thursday where many bargains can be had. There are also numerous Supermarkets/small shops and numerous Restaurants. A bit further out are the towns of Sciacca (small fishing port) with many interesting shops and Agrigento which has Museums and some very interesting Greek Ruins A must to visit. "We stayed in this house from 14th to 21st of June 2012 – 2 families (4 adults + 3 children). This is a very nice, clean and well equipped apartment. Perfect for holiday with children. 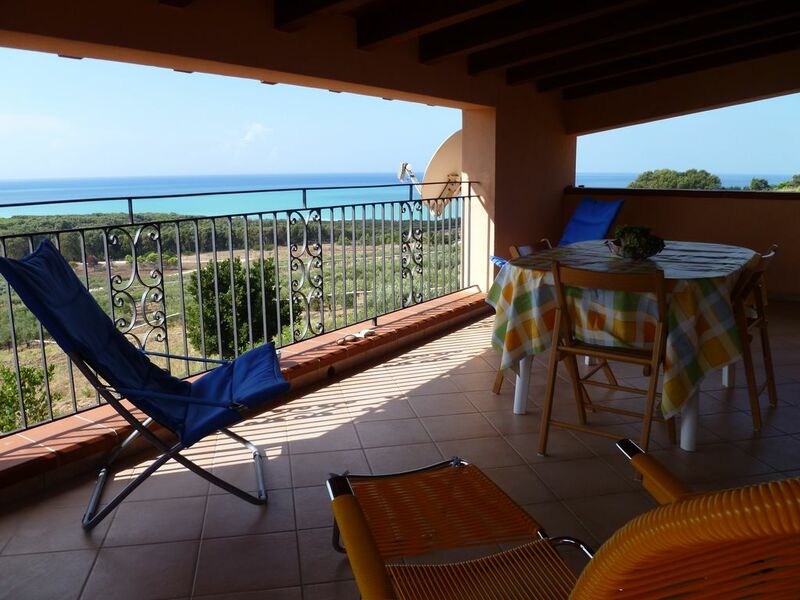 The apartment is spacious, has a wonderful terrace with beautiful sea views. The hosts are very hospitable and helpful. They gave us a wine, olive and fruits from their own garden. Near the house is pretty stony beach, but it has a steep descent to the water, which can be confusing for young children. In our opinion the best place for children is the beach at Eraclea Minoa (10 minutes by car), which also is one of the most beautiful beaches in Sicily with a beautiful white cliff. We higly recommend this place for a holiday stay." "We stayed in this house from 16th to 30th June 2012. The owners are both lovely people, very welcoming, helpful and friendly. The location of the house is breathtaking, with an amazing view of the Mediterranean and different shades of green, not only from the huge veranda but also from the two bedrooms. The house was more than big enough for our two kids (3.5 and 2 years old). They loved running around the house and the veranda. We thought the house was absolutely spotless and we had everything we needed in terms of cooking, cleaning and washing. The house is high up in a secluded spot, so there’s usually a breeze in the evenings, which makes it easier to have a decent sleep. You can leave the windows open since they all have mosquito nets to keep the flies away! After a few days, we realised that the kids loved to go to the beaches most, so we drove to 6-7 different ones. The closest beach is only 2 mins away by car and there are parking spaces inside the little forest (although at weekends it may be more difficult to park). The furthest away beach we went to was near Scala dei Turca (a white rock formation) which took us 20 minutes to drive to. In the end, we realised that, in terms of the clearness of the sea water, the closest beach was the best, although the water becomes deep pretty quickly. If you want shallow waters, then go to Scala dei Turca. The closest town is Ribera (10-15 minutes drive away). There is a little Lidl (forgive the pun) there but it is almost ridiculous to go to Lidl in Sicily. There is an open market on Thursdays (you need to go a bit early before it gets too hot) where you can buy fresh fruit, vegetables and fish (or clothes and various other things as well). There are also bakeries and patisseries in Ribera for bread and local delicacies (and of course, wonderful ice cream); simply ask the owners for information. We loved Sicily and the house, but most of all the owners. We will definitely go and see them again. We very strongly recommend their house for a quiet and beautiful holiday. "The apartment was better than advertised. First rate throughout, modern and clean. The owner was gracious, helpful and warm. The setting was perfect. We would like to return there for a longer stay. Highly recommended." Wir haben eine wirklich entspannte Zeit in Borgo Bonsignore verbracht: Kilometerlanger, naturbelassener Sandstrand ohne einen einzigen Badegast, traumhafte Sonnenuntergänge hinter den Felsen an der Steilküste und Stille, Stille, Stille. Und das Allerbeste: Es gibt bei Donna Caterina einen Khakibaum, der täglich pflückreife Früchte trägt - ein Gedicht. Die Wohnung war sehr sauber und nett eingerichtet. Die Vermieterin ist sehr freundlich und sie und ihr Mann haben uns am 2. Abend zur selbstgemachten Pizza eingeladen.Wenn man es einsam mag, ist es der ideale Urlaubsort. Tariffe scontate in relazione alla durata, Richiesto supplemento per il riscaldamento in base alla stagione, Consegna delle chiavi da parte del Proprietario presente in loco.